Tired of fighting with your fax machine? 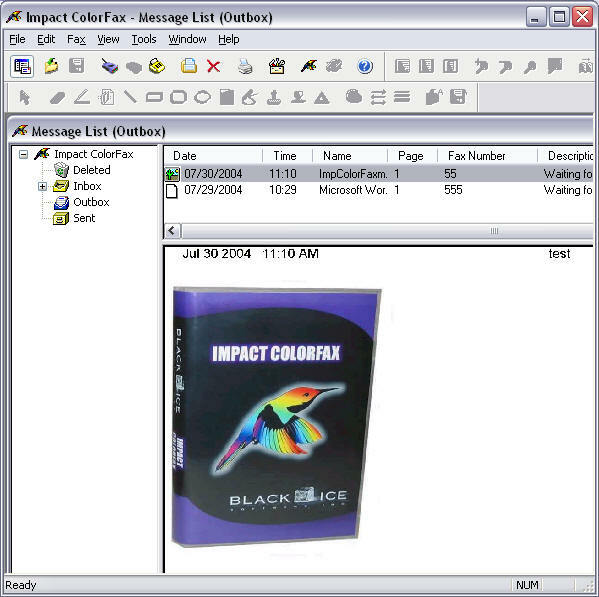 The Free Impact Color Fax™ Lite software is designed for users who need a simple but effective PC color faxing software solution. Send and receive faxes from the comfort of your home computer. Send any file on your computer as a fax, or use the Free Impact Color Fax Lite software with a scanner or multifunction printer to scan and fax. 33.6K (V.34) Faxing support added. Send faxes twice as fast as before, send a color fax in less than 1 minute! Sort faxes by Date, Time, Number of pages, etc. Automated document conversion from any application by printing to the Impact Color Fax Printer. Supports up to four fax modems and is compatible with any Class 1, Class 2, or Class 2.0 fax modem.